Julaihi and Assistant Minister of Water Supply Datuk Liwan Lagang during their arrival to attend the DUN sitting this morning. KUCHING: The construction of two bridges – Muara Lassa Bridge and the Batang Paloh Bridge in Daro expected to commence in the first quarter of 2019. 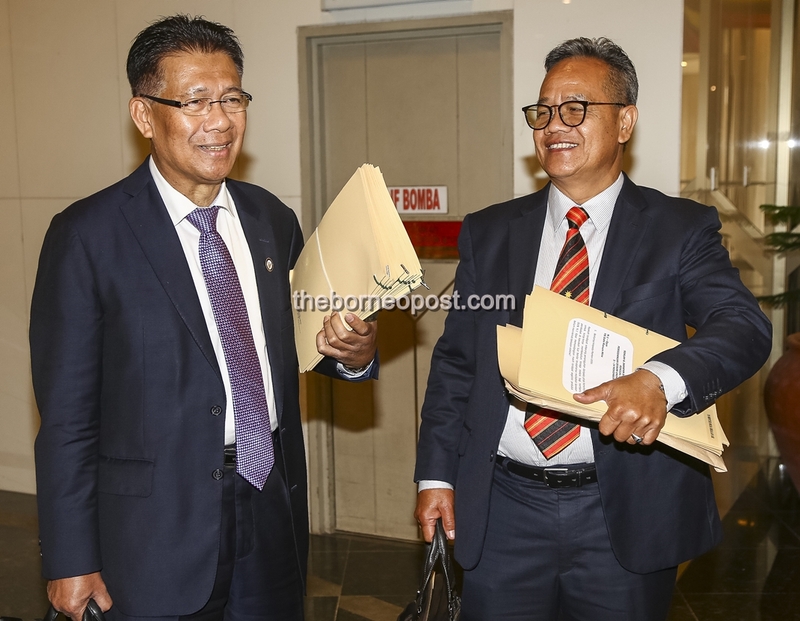 Coastal Road Assistant Minister Datuk Julaihi Narawi said the two bridges are currently in the design process and will be tendered at the end of this year. “Muara Lassa bridge and Batang Paloh bridge have been approved under the coastal road program which is fully funded by the state government. “It is expected to commence implementation or construction in the first quarter of 2019,” he said in reply to a question from Safiee Ahmad (PBB-Daro) during the State Legislative Assembly (DUN) sitting today. Julaihi added that the projects were listed under walkabout projects of Chief Minister Datuk Patinggi Abang Johari Tun Openg. On the Muara Lassa bridge, he said it is a 2.43-kilometer (2.4 km) bridge buffer bridge. “This means that when the completion of the Muara Lassa bridge, it is the second longest bridge after the Batang Lupar bridge. “At the same time, we need to build a road on both sides of the river to the bridge that involves a 3.5km long road,” he said. As for the Batang Paloh bridge, Julaihi said it is a 1.7km long bridge as well as a concrete buffer bridge involving a 4km long road. According to him, various designs are being considered for the two projects but the chosen design depends on government-approved allocation. “But what is important is providing connectivity which is our priority when building a bridge,” he said.